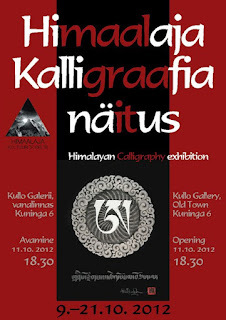 From 9th to near the end of October, the Society of Himalayan Culture in Tallinn presented the "Himalayan Film and Cultural Days 2012". This featured a joint exhibition in the Kullo Gallery at the heart of the beautiful medieval capital of Estonia. 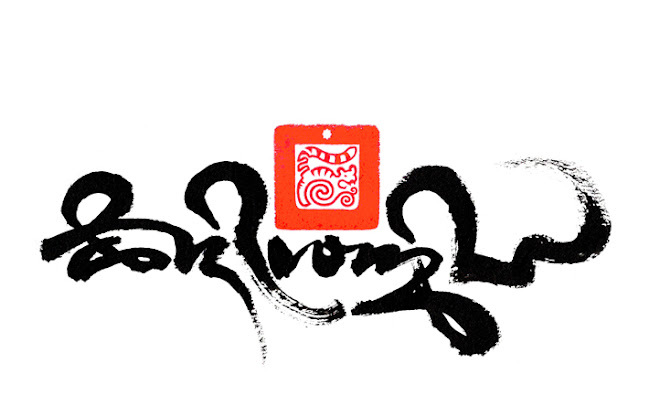 Tashi Mannox exhibited a number of his major calligraphy artworks along with other Himalayan and Tibetan artists Puntsok Tsering, and Tashi Norbu. 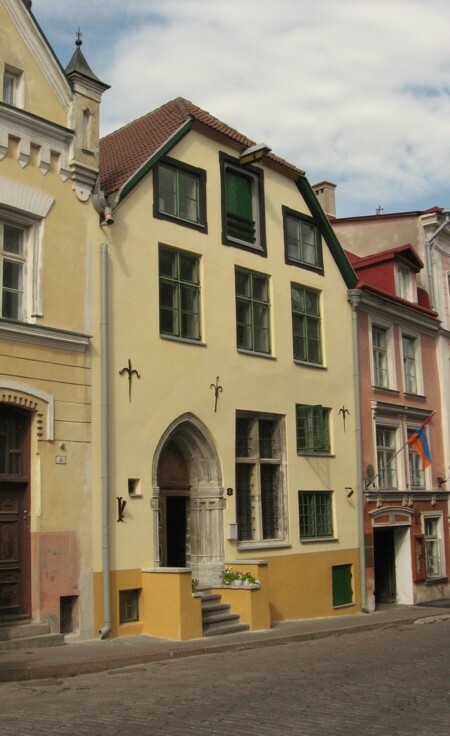 The Kullo Gallery, Tallinn, Estonia. The Society of Himalayan Culture also especially commissioned calligraphy works from artists of the smaller least known Himalayan ethnic groups, these included the rare Limbu*, Magar** and the more known Ranjana*** scripts. *scroll down below. A Sanskrit prayer for well being and protection, arranged by the artist as a traditional illuminated title page of Indian and Tibetan Buddhist Manuscripts. The Script style is called Ranjana of the indigenous Newar*** people of the Kathmandu Valley. The Mani mantra in the Ranjana script that has a close relationship with its grandfather Lansta Sanskrit. 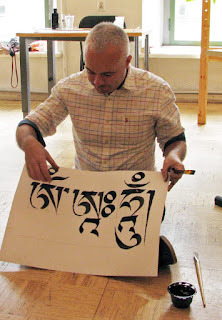 Tashi lead a two day Tibetan writing workshop in the Kullo exhibition space, that was very well attended, a list of activities are shown in the link here. Tashi explaining the construction of the 'hum' syllable and its deeper symbolic meaning. Happy participants from the first days work. Participants on the second day. The conclusion of the workshops ended with Tashi demonstrating how to execute a 'free' expressive style calligraphy. Limbu is a Tibeto-Burman language spoken in the Himalayan regions of Nepal, Bhutan, Sikkim, Kashmir, and Darjeeling in India. According to traditional histories, the script was first invented in the late 9th century by King Sirijonga Haang. This fell out of use, to be reintroduced in the 18th century developing during the expansion of Buddhism when Limbuwan (small independent states of Limbu) was administered by Sikkim. The Limbu hero Sirijonga (Te-ongsi Sirijunga Xin Thebe), a great educationalist, scholar, historian and philosopher of that time, began an active campaign against this Tibetan Buddhist cultural encroachment by promoting Limbu script, language and culture from village to village. For this he was killed by the Sikkim Buddhist authorities, tied and shot by arrows. Limbu learning centers were destroyed and Sirjonga’s disciples murdered or suppressed. For his work, Sirjonga was considered a martyr for Limbus and the Limbu script has been subsequently named after him as Sirjonga script. Today Limbu is recognized in Sikkim as one of its official languages since 1970 and school course books in Limbu are available. In Nepal, the story of prosecuting Limbu language promotion continued, particularly with teachers like Bir Nembang arrested in the 1980s for secretly teaching Limbu. Many of these teachers fled to India. Only after a democratic revolution in 1990 Limbu language activists were able to freely operate and openly work for the development of Sirjonga script. Magar languages are spoken in the Himayalas from Nepal to Sikkim in India. During the 17th and early 18th centuries, the Magar kingdom was one of the strongest of west Nepal. Later they served as a large bulk of the footsoldiers for Hindu Khas Shah kings who went on to unify Nepal . Since the 19th century they occupied the largest number of Gurkha soldiers under the British Army and adopted many Hindu practices as well as Devanagri script since they did not have script at that time. They speak 3 vastly different languages called Kham, Kaike and Dhut and together represent the largest indigenous group of Nepal today. After the democratic revolution of Nepal in 1990, Magar indigenous rights activism grew and started shifting customs away from what they saw was former oppressive Hindu rule. In 1992, a key Magar scholar, MS Thapa lay claim that Buddha, having been born in West Nepal, must have also been Magar as the ancient kingdoms of that time in that area must have been Magar. Since the script used largely at that time since 4th century BC Ancient India was Brahmi, Magars must have used Brahmi script which has been named as Akkha Rika according to Buddhist texts. Furthermore “Rikaa” means script or alphabet in classical Magar language. 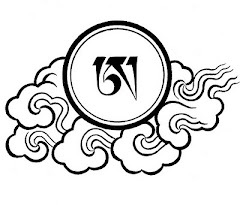 From these ideas of MS Thapa, Magar activists began developing Akkha Rika, essentially a modernized form of Brahmi, adding more symbols to fit sounds in the Magar language. This script became adopted as the official script of Magars and is used in publications to teach Dhut Magar language. This is a new process as most young people are only beginning to get introduced both to the language and the script. This 20 year old script is still in development to suit the other Magar languages, and has inspired some ethnic groups such as the Gurung who are now using the Brahmi model to develop a new script today. The Newar are the indigenous people of the Kathmandu Valley as well as its traditional artists, builders and artisans. Their Tibeto-Burman language, more correctly known as Nepal Bhasa, has been written in a number of scripts, primarily Ranjana and Prachalit script derived from Brahmi script. Ranjana developed in Kathmandu Valley during the 10th century AD and spread into other areas of Asia from Mongolia to Japan for sacred Tibetan Buddhism texts, and was also used to write Maithili language for some period. The valley developed 9 types of scripts including Prachalit, Ranjana, Golmol, and Bhujinmol but only Ranjana and Prachalit continue in use today. Nepal Bhasa began suffer after the Shah Dynasty from West Nepal took over Kathmandu Valley in the late 18th century. The repressive policies of the Rana Dynasty (1846–1951 AD) attempted to wipe it out. In 1906, legal documents written in Nepal Bhasa were declared unenforceable, rulers forbade literature in Nepal Bhasa, and writers were sent to jail. In 1944, Buddhist monks who wrote in the language were expelled from the country. After the overthrow of the Rana Dynasty in 1951,restrictions on publication in Nepal Bhasa were removed. Books, magazines and newspapers appeared. Today it is experiencing a revival due to recent cultural awareness.